According to a new study published in the International Journal of Behavioral Nutrition and Physical Activity, researchers at the University of Sydney in Australia suggest early death could be reduced by 12% to 14% by merely replacing an hour of sitting with walking each day. The four-year study included 201,129 adults aged 45 and older. Researchers also found that swapping an hour of sitting daily with standing could reduce the risk of early death by five percent. There was also a six-percent decrease in early death risk for people not getting sufficient sleep who swapped an hour of sitting with sleeping daily. The research team also found that there was a 13%–17% increase in early death risk when an hour of exercising or walking daily was replaced with sedentary behavior like sitting. U.S. and U.K. data reveals that people over 70 years old will spend about 65% to 80% of their time sedentary. This means that substituting sitting time with standing or walking could have a major impact on the health of older adults. According to the Centers for Disease Control and Prevention, adults are advised to get a minimum of 150 minutes each week of moderately intense aerobic activity (e.g. 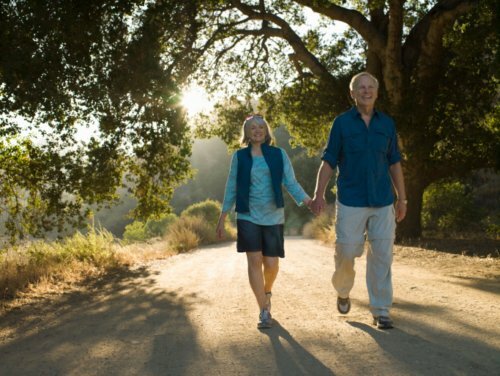 walking) and muscle-strengthening activities on at least two days each week. Stamatakis, E., et al., “All-cause mortality effects of replacing sedentary time with physical activity and sleeping using an isotemporal substitution model: a prospective study of 201,129 mid-aged and older adults,” Journal of Behavioral Nutrition and Physical Activity 2015; 12: 121, doi: 10.1186/s12966-015-0280-7. Ellis, M., “To live longer, replace 1 hour of sitting with walking daily,” Medical News Today, October 4, 2015; http://www.medicalnewstoday.com/articles/300391.php. University of Sydney, “Swap the couch for a walk to avoid an early death,” EurekAlert web site, September 30, 2015; http://www.eurekalert.org/pub_releases/2015-09/uos-stc093015.php. “How much physical activity do adults need?” Centers for Disease Control and Prevention web site, last updated June 4, 2015; http://www.cdc.gov/physicalactivity/basics/adults/index.htm, last accessed October 5, 2015.